Leader of the women in public prayer. The separation of the sexes at Jewish worship was insisted on even in the days of the Temple (Suk. 51b); but women were by tradition recognized as entitled to appoint a prayer-leader from among themselves (Ber. 45b; 'Ar. 3a). While there have always been educated, even learned, Jewesses, the greater prominence usually given to boys in the instruction of Hebrew, through a misinterpretation of the diction of R. Eliezer in Soṭah iii. 4 (see M. Friedländer, "The Jewish Religion," London, 1900, p. 481, note) resulted in many women remaining unversed in the sacred language. Again, the duties of the mother and the general pressure of domestic ceremonial on the pious Jewess in every age resulted in the women becoming generally rarer visitors at the synagogue than the men, and only exceptional attendants on ordinary week-days. The custom, therefore, developed, and is still followed in eastern Europe, for women to meet in small groups, in which one of them, a more fluent reader than her sister worshipers, and provided, in the old days of costly books, with a single copy of the manual, read aloud in the vernacular of the locality the "Teḥinnes" or supplications (see Judæo-German) or from some volume of ethical and theological instruction. In countries where Judæo-German is spoken, this reading-woman is called the "sagerin" (usually pronounced "zoogerin"). She is at the present day remarkable for the persistence with which, whatever the character of the text, she recites the devotions or the lessons in a wailing croon (comp. Oren) punctuated with sobs (comp. Jew. Encyc. iv. 551, s.v. Devotional Literature) and in unison with her audience. This peculiar custom dates probably from the Chmielnicki massacres of 1649. The "sagerin" was known also in the Middle Ages. The ancient synagogue at Worms had no gallery for the women, who were accommodated, instead, in a chapel on the same level as the body of the synagogue, but separated by a wall between four and five feet in thickness. This wall was removed in 1840, and the former chapel made part of the men's portion of the synagogue. Previously communication was had only through a narrow hatch, covered with a curtain. The women could hear nothing distinctly from the synagogue; and a "sagerin" was a necessity. In the middle of the thirteenth century this female officiant was a young woman of unusual capacity-Urania, the daughter of Abraham, himself chief cantor of the synagogue; her gravestone, still standing in good condition in the Worms cemetery, states her to have "chanted piyyuṭim and supplications for the women"—to have acted, in fact, as a female cantor. 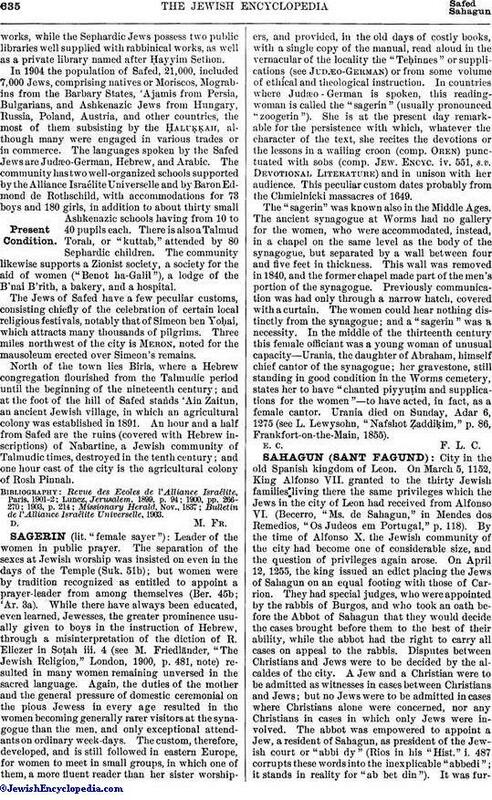 Urania died on Sunday, Adar 6, 1275 (see L. Lewysohn, "Nafshot Ẓaddiḳim," p. 86, Frankfort-on-the-Main, 1855). E. C. F. L. C.